The webmaster of this site has invited me to write an introduction to Henry van Dyke’s wonderful short story, ‘The Source’, which I am most pleased to do, and to explain why this story so well-belongs on a website dedicated to the Teachings of the Ascended Masters. Mark Prophet, the Messenger and co-founder (on the physical plane) of The Summit Lighthouse, used to read this story to the congregation at each summer conference, once every year – so we can clearly see that the story must hold a message of some great importance. Van Dyke’s story is actually a part of an entire book, The Blue Flower, but stands as a tale in its own right. It is very allegorical, pertaining to the most important themes of the spiritual Path for an individual and even for an entire civilization. The Source is God. More specifically, for each individual it is their own Individualized Mighty I AM Presence. The Water represents the Light of God as illimitable ‘electrons’ of Purity, Life, Love, Abundance, Perfection, and all of God’s Qualities as that Light flows down the crystal cord from the God Self or I AM Presence to the four lower bodies. The Light flows down the cord individually for each person, but collectively a society or civilization rises or falls, and displays or contains all these Qualities of God’s Abundance, according to how much of the Light is received by the peoples collectively. If the majority are, due to their own lack of communion with God, receiving little of this Light, then this lack will be exhibited throughout the society. But if a nation or civilization are on the whole in great attunement with God, then there need never be any lack or want for anything, either of a physical nature or, more importantly still, no lack of a spiritual nature. However, even in situations whereby the majority of the people are hardly at all in touch with their own God Self, a certain ‘balance’ can be held by individual Lightbearers, whose Light, received as it flows and floods joyfully down their crystal cords, may be sufficient to radiate out from them in aid to all others. In the story, Ruamie represents such a Lightbearer. Faithfully, never failing on a daily basis, she returns to The Source, even though she alone does so, and the result is a certain bare minimum of Light to all, enough for them all just to sustain a mundane physical existence. When a nation or civilization lacks communion with its Source, since the people do not regularly ‘visit’ with their I AM Presences, this may eventually outplay in everything from spiritual aridity to a drying up of art and culture, individual depressions and illnesses which go unchecked, economic debacle and even starvation. Where these situations are not all present, it isn’t necessarily because all are in regular communion with God, but may be simply because some – at least a sufficient number – are. And when such a time arises such as that larger and greater numbers of the people are in regular communion and Oneness with their Source - then a true Golden Age can manifest. The cisterns in the story, as an attempt to ‘contain’ and control the ‘water’ (Light) which is in such short supply, represent the manner in which those who do not themselves have a sufficient direct tie to their own God Self, and therefore receive very little direct Light down their own crystal cords, are almost ‘running on dry’. In other words, they are ‘getting by’ and just existing on the Light they may have received at some former time, or from another, or perhaps as a part of the initial gift of life bestowed upon them by the Holy Spirit at birth and in their youth. But virtually no fresh ‘water’ (Light from God) is being received directly by them now. They believe that all is well since they have enough ‘water’ for that day – but they do not realize it is running out because they no longer commune truly with God and receive fresh, replenishing ‘water’ each day. In the Ascended Masters’ Teachings we learn that, indeed, the crystal cord which ties us to our God Presence, and through which we receive the gift of Life each day and even each and every moment as the impetus to beat our hearts, may be as thin as a thread, or may be as broad as one’s own body in the case of an Adept. Our Holy Christ Self, acting in Loving Wisdom, broadens or narrows this crystal cord according to whether or not we are rightly invoking the Light, and according to whether or not we correctly use the Light, this Gift of Life, once it is received. For some years after the Ascended Masters’ Activity, The Temple of The Presence, was founded, its Messengers, Carolyn and Monroe Shearer, resurrected and continued the practice of Mark Prophet, and read ‘The Source’ to the congregation each summer Class. I’m sure they won’t mind if I say that I attended only the first or second reading of ‘The Source’ during a July conference that was read without problem. Apparently the first time the story was read out, at some point the Messenger choked with emotion and could not continue. So the book was passed to the other Messenger, only for this one to choke with emotion at the story as well. Again, for at least one if not two more years, it was found to be very difficult to read it aloud to the congregation. On the one hand I found this very moving, and indicative of the great depth of feeling these Messengers feel for the plight of a humanity who have largely forgotten their Source. In one recording however I have heard Monroe give a deeper explanation. I recount it not as a transcription but simply as best I can from memory. On the subject of this compassionate difficulty in reading the story in conferences on those first occasions, the beloved Maha Chohan told them that it was not just the written story and not just by any means their own emotions. Rather, in reading this story they were contacting [this is my wording – DT] the record and actual state of humanity at this time, who are indeed so in need of contact with their Source. They were ‘feeling’ the actual plight of the world. The regular ‘hour of visitation’ in the story is of course our regular, daily communion with God. People of different lands and faiths have different ways of establishing this communion daily. As disciples of the Ascended Masters we, of course, do so through the Science of the Spoken Word in decrees and invocations, though we may well use other methods such as prayer and meditation as well. By the regular practice of communion and contact with our own Source, our own Individualized Mighty I AM Presence - the literal Source of our very life and being - we may progressively widen and widen our crystal cord over time. The initial trickle becomes a stream. In time the stream can become a torrent. Eventually we become so ensconced in this cascading, illimitable Light that there is no longer even the false appearance or maya of separation. We and the Source become One – yet still continue to flood the rest of the world with the river of Life. Did Henry van Dyke, the author, consciously know the meaning behind all this allegory? I do not know for certain, but think he surely must have. Though the story is also inspired, at the very least from his Holy Christ Self, if not from other ‘agencies’. Do enjoy this most poetic piece of wordsmithry! And I would like to say that I think it was a wonderful idea of Allen Buresz to place it permanently online on this site, so that all chelas of the Masters, now and in times to come, can know of and read it. In the middle of the land that is called by its inhabitants Koorma, and by strangers the Land of the Half-forgotten, I was toiling all day long through heavy sand and grass as hard as wire. Suddenly, toward evening, I came upon a place where a gate opened in the wall of mountains, and the plain ran in through the gate, making a little bay of level country among the hills. Now this bay was not brown and hard and dry, like the mountains above me, neither was it covered with tawny billows of sand like the desert along the edge of which I had wearily coasted. But the surface of it was smooth and green; and as the winds of twilight breathed across it they were followed by soft waves of verdure, with silvery turnings of the under sides of many leaves, like ripples on a quiet harbour. There were fields of corn, filled with silken rustling, and vineyards with long rows of trimmed maple-trees standing each one like an emerald goblet wreathed with vines, and flower-gardens as bright as if the earth had been embroidered with threads of blue and scarlet and gold, and olive-orchards frosted over with delicate and fragrant blossoms. Red-roofed cottages were scattered everywhere through the sea of greenery, and in the centre, like a white ship surrounded by a flock of little boats, rested a small, fair, shining city. I wondered greatly how this beauty had come into being on the border of the desert. Passing through the fields and gardens and orchards, I found that they were all encircled and lined with channels full of running water. I followed up one of the smaller channels until it came to a larger stream, and as I walked on beside it, still going upward, it guided me into the midst of the city, where I saw a sweet, merry river flowing through the main street, with abundance of water and a very pleasant sound. There were houses and shops and lofty palaces and all that makes a city, but the life and joy of all, and the one thing that I remember best, was the river. For in the open square at the edge of the city there were marble pools where the children might bathe and play; at the corners of the streets and on the sides of the houses there were fountains for the drawing of water; at every crossing a stream was turned aside to run out to the vineyards; and the river was the mother of them all. There were but few people in the streets, and none of the older folk from whom I might ask counsel or a lodging; so I stood and knocked at the door of a house. It was opened by an old man, who greeted me with kindness and bade me enter as his guest. After much courteous entertainment, and when supper was ended, his friendly manner and something of singular attractiveness in his countenance led me to tell him of my strange journeyings in the land of Koorma and in other lands where I had been seeking the Blue Flower, and to inquire of him the name and the story of his city and the cause of the river which made it glad. "My son," he answered, "this is the city which was called Ablis, that is to say, Forsaken. For long ago men lived here, and the river made their fields fertile, and their dwellings were full of plenty and peace. But because of many evil things which have been half-forgotten, the river was turned aside, or else it was dried up at its source in the high place among the mountains, so that the water flowed down no more. The channels and the trenches and the marble pools and the basins beside the houses remained, but they were empty. So the gardens withered; the fields were barren; the city was desolate; and in the broken cisterns there was scanty water. "Then there came one from a distant country who was very sorrowful to see the desolation. He told the people that it was vain to dig new cisterns and to keep the channels and trenches clean; for the water had come only from above. The Source must be found again and reopened. The river would not flow unless they traced it back to the spring, and visited it continually, and offered prayers and praises beside it without ceasing. Then the spring would rise to an outpouring, and the water would run down plentifully to make the gardens blossom and the city rejoice. "So he went forth to open the fountain; but there were few that went with him, for he was a poor man of lowly aspect, and the path upward was steep and rough. But his companions saw that as he climbed among the rocks, little streams of water gushed from the places where he trod, and pools began to gather in the dry river-bed. He went more swiftly than they could follow him, and at length he passed out of their sight. A little farther on they came to the rising of the river and there, beside the overflowing Source, they found their leader lying dead." "That was a strange thing," I cried, "and very pitiful. Tell me how it came to pass, and what was the meaning of it." "I cannot tell the whole of the meaning," replied the old man, after a little pause, "for it was many years ago. But this poor man had many enemies in the city, chiefly among the makers of cisterns, who hated him for his words. I believe that they went out after him secretly and slew him. But his followers came back to the city; and as they came the river began to run down very gently after them. They returned to the Source day by day, bringing others with them; for they said that their leader was really alive, though the form of his life had changed, and that he met them in that high place while they remembered him and prayed and sang songs of praise. More and more the people learned to go with them, and the path grew plainer and easier to find. The more the Source was revisited, the more abundant it became, and the more it filled the river. All the channels and the basins were supplied with water, and men made new channels which were also filled. Some of those who were diggers of trenches and hewers of cisterns said that it was their work which had wrought the change. But the wisest and best among the people knew that it all came from the Source, and they taught that if it should ever again be forgotten and left unvisited the river would fail again and desolation return. So every day, from the gardens and orchards and the streets of the city, men and women and children have gone up the mountain-path with singing, to rejoice beside the spring from which the river flows and to remember the one who opened it. We call it the River Carita. And the name of the city is no more Ablis, but Saloma, which is Peace. And the name of him who died to find the Source for us is so dear that we speak it only when we pray. "But there are many things yet to learn about our city, and some that seem dark and cast a shadow on my thoughts. Therefore, my son, I bid you to be my guest, for there is a room in my house for the stranger; and to-morrow and on the following days you shall see how life goes with us, and read, if you can, the secret of the city." That night I slept well, as one who has heard a pleasant tale, with the murmur of running water woven through my dreams; and the next day I went out early into the streets, for I was curious to see the manner of the visitation of the Source. Already the people were coming forth and turning their steps upward in the mountain-path beside the river. Some of them went alone, swiftly and in silence; others were in groups of two or three, talking as they went; others were in larger companies, and they sang together very gladly and sweetly. But there were many people who remained working in their fields or in their houses, or stayed talking on the corners of the streets. Therefore I joined myself to one of the men who walked alone and asked him why all the people did not go to the spring, since the life of the city depended upon it, and whether, perhaps, the way was so long and so hard that none but the strongest could undertake it. "Sir," said he, "I perceive that you are a stranger, for the way is both short and easy, so that the children are those who most delight in it; and if a man were in great haste he could go there and return in a little while. But of those who remain behind, some are the busy ones who must visit the fountain at another hour; and some are the careless ones who take life as it comes and never think where it comes from; and some are those who do not believe in the Source and will hear nothing about it." "How can that be?" I said; "do they not drink of the water, and does it not make their fields green?" "It is true," he said; "but these men have made wells close by the river, and they say that these wells fill themselves; and they have digged channels through their gardens, and they say that these channels would always have water in them even though the spring should cease to flow. Some of them say also that it is an unworthy thing to drink from a source that another has opened, and that every man ought to find a new spring for himself; so they spend the hour of the visitation, and many more, in searching among the mountains where there is no path." While I wondered over this, we kept on in the way. There was already quite a throng of people all going in the same direction. And when we came to the Source, which flowed from an opening in a cliff, almost like a chamber hewn in the rock, and made a little garden of wild-flowers around it as it fell, I heard the music of many voices and the beautiful name of him who had given his life to find the forgotten spring. Then we came down again, singly and in groups, following the river. It seemed already more bright and full and joyous. As we passed through the gardens I saw men turning aside to make new channels through fields which were not yet cultivated. And as we entered the city I saw the wheels of the mills that ground the corn whirling more swiftly, and the maidens coming with their pitchers to draw from the brimming basins at the street corners, and the children laughing because the marble pools were so full that they could swim in them. There was plenty of water everywhere. For many weeks I stayed in the city of Saloma, going up the mountain-path in the morning, and returning to the day of work and the evening of play. I found friends among the people of the city, not only among those who walked together in the visitation of the Source, but also among those who remained behind, for many of them were kind and generous, faithful in their work, and very pleasant in their conversation. Yet there was something lacking between me and them. I came not onto firm ground with them, for all their warmth of welcome and their pleasant ways. They were by nature of the race of those who dwell ever in one place; even in their thoughts they went not far abroad. But I have been ever a seeker, and the world seems to me made to wander in, rather than to abide in one corner of it and never see what the rest has in store. Now this was what the people of Saloma could not understand, and for this reason I seemed to them always a stranger, an alien, a guest. The fixed circle of their life was like an invisible wall, and with the best will in the world they knew not how to draw me within it. And I, for my part, while I understood well their wish to rest and be at peace, could not quite understand the way in which it found fulfilment, nor share the repose which seemed to them all-sufficient and lasting. In their gardens I saw ever the same flowers, and none perfect. At their feasts I tasted ever the same food, and none that made an end of hunger. In their talk I heard ever the same words, and none that went to the depth of thought. The very quietude and fixity of their being perplexed and estranged me. What to them was permanent, to me was transient. They were inhabitants: I was a visitor. The one in all the city of Saloma with whom was most at home was Ruamie, the little granddaughter of the old man with whom I lodged. To her, a girl of thirteen, fair-eyed and full of joy, the wonted round of life had not yet grown to be a matter of course. She was quick to feel and answer the newness of every day that dawned. When a strange bird flew down from the mountains into the gardens, it was she that saw it and wondered at it. It was she that walked with me most often in the path to the Source. She went out with me to the fields in the morning and almost every day found wild-flowers that were new to me. At sunset she drew me to happy games of youths and children, where her fancy was never tired of weaving new turns to the familiar pastimes. In the dusk she would sit beside me in an arbour of honeysuckle and question me about the flower that I was seeking,--for to her I had often spoken of my quest. "Is it blue," she asked, "as blue as the speedwell that grows beside the brook?" "Yes, it is as much bluer than the speedwell, as the river is deeper than the brook." "And is it she asked, "as bright as the drops of dew in the moonlight?" "Yes, it is brighter than the drops of dew as the sun is clearer than the moon." "And is it sweet," she asked, "as sweet as the honeysuckle when the day is warm and still?" "Yes, it is as much sweeter than the honeysuckle as the night is stiller and more sweet than the day." "Tell me again," she asked, "when you saw it, and why do you seek it?" "Once I saw it when I was a boy, no older than you. Our house looked out toward the hills, far away and at sunset softly blue against the eastern sky. It was the day that we laid my father to rest in the little burying-ground among the cedar-trees. There was his father's grave, and his father's father's grave, and there were the places for my mother and for my two brothers and for my sister and for me. I counted them all, when the others had gone back to the house. I paced up and down alone, measuring the ground; there was room enough for us all; and in the western corner where a young elm-tree was growing,--that would be my place, for I was the youngest. How tall would the elm-tree be then? I had never thought of it before. It seemed to make me sad and restless,--wishing for something, I knew not what,--longing to see the world and to taste happiness before I must sleep beneath the elm-tree. Then I looked off to the blue hills, shadowy and dream-like, the boundary of the little world that I knew. And there, in a cleft between the highest peaks I saw a wondrous thing: for the place at which I was looking seemed to come nearer and nearer to me; I saw the trees, the rocks, the ferns, the white road winding before me; the enfolding hills unclosed like leaves, and in the heart of them I saw a Blue Flower, so bright, so beautiful that my eyes filled with tears as I looked. It was like a face that smiled at me and promised something. Then I heard a call, like the note of a trumpet very far away, calling me to come. And as I listened the flower faded into the dimness of the hills." "Did you follow it," asked Ruamie, "and did you go away from your home? How could you do that?" "Yes, Ruamie, when the time came, as soon as I was free, I set out on my journey, and my home is at the end of the journey, wherever that may be." "And the flower," she asked, "you have seen it again?" "Once again, when I was a youth, I saw it. After a long voyage upon stormy seas, we came into a quiet haven, and there the friend who was dearest to me, said good-by, for he was going back to his own country and his father's house, but I was still journeying onward. So as I stood at the bow of the ship, sailing out into the wide blue water, far away among the sparkling waves I saw a little island, with shores of silver sand and slopes of fairest green, and in the middle of the island the Blue Flower was growing, wondrous tall and dazzling, brighter than the sapphire of the sea. Then the call of the distant trumpet came floating across the water, and while it was sounding a shimmer of fog swept over the island and I could see it no more." "Was it a real island," asked Ruamie. "Did you ever find it?" "Never; for the ship sailed another way. But once again I saw the flower; three days before I came to Saloma. It was on the edge of the desert, close under the shadow of the great mountains. A vast loneliness was round about me; it seemed as if I was the only soul living upon earth; and I longed for the dwellings of men. Then as I woke in the morning I looked up at the dark ridge of the mountains, and there against the brightening blue of the sky I saw the Blue Flower standing up clear and brave. It shone so deep and pure that the sky grew pale around it. Then the echo of the far-off trumpet drifted down the hillsides, and the sun rose, and the flower was melted away in light. So I rose and travelled on till I came to Saloma." "And now," said the child, "you are at home with us. Will you not stay for a long, long while? You may find the Blue Flower here. There are many kinds in the fields. I find new ones every day." "I will stay while I can, Ruamie," I answered, taking her hand in mine as we walked back to the house at nightfall, "but how long that may be I cannot tell. For with you I am at home, yet the place where I must abide is the place where the flower grows, and when the call comes I must follow it." "Yes," said she, looking at me half in doubt, "I think I understand. But wherever you go I hope you will find the flower at last." In truth there were many things in the city that troubled me and made me restless, in spite of the sweet comfort of Ruamie's friendship and the tranquillity of the life in Saloma. I came to see the meaning of what the old man had said about the shadow that rested upon his thoughts. For there were some in the city who said that the hours of visitation were wasted, and that it would be better to employ the time in gathering water from the pools that formed among the mountains in the rainy season, or in sinking wells along the edge of the desert. Others had newly come to the city and were teaching that there was no Source, and that the story of the poor man who reopened it was a fable, and that the hours of visitation were only hours of dreaming. There were many who believed them, and many more who said that it did not matter whether their words were true or false, and that it was of small moment whether men went to visit the fountain or not, provided only that they worked in the gardens and kept the marble pools and basins in repair and opened new canals through the fields, since there always had been and always would be plenty of water. As I listened to these sayings it seemed to me doubtful what the end of the city would be. And while this doubt was yet heavy upon me, I heard at midnight the faint calling of the trumpet, sounding along the crest of the mountains: and as I went out to look where it came from, I saw, through the glimmering veil of the milky way, the shape of a blossom of celestial blue, whose petals seemed to fall and fade as I looked. So I bade farewell to the old man in whose house I had learned to love the hour of visitation and the Source and the name of him who opened it; and I kissed the hands and the brow of the little Ruamie who had entered my heart, and went forth sadly from the land of Koorma into other lands, to look for the Blue Flower. In the Book of the Voyage without a Harbour is written the record of the ten years which passed before I came back again to the city of Saloma. It was not easy to find, for I came down through the mountains, and as I looked from a distant shoulder of the hills for the little bay full of greenery, it was not to be seen. There was only a white town shining far off against the brown cliffs, like a flake of mica in a cleft of the rocks. Then I slept that night, full of care, on the hillside, and rising before dawn, came down in the early morning toward the city. The fields were lying parched and yellow under the sunrise, and great cracks gaped in the earth as if it were thirsty. The trenches and channels were still there, but there was little water in them; and through the ragged fringes of the rusty vineyards I heard, instead of the cheerful songs of the vintagers, the creaking of dry windlasses and the hoarse throb of the pumps in sunken wells. The girdle of gardens had shrunk like a wreath of withered flowers, and all the bright embroidery, of earth was faded to a sullen gray. At the foot of an ancient, leafless olive-tree I saw a group of people kneeling around a newly opened well. I asked a man who was digging beside the dusty path what this might mean. He straightened himself for a moment, wiping the sweat from his brow, and answered, sullenly, "They are worshipping the windlass: how else should they bring water into their fields?" Then he fell furiously to digging again, and I passed on into the city. There was no sound of murmuring streams in the streets, and down the main bed of the river I saw only a few shallow puddles, joined together by a slowly trickling thread. Even these were fenced and guarded so that no one might come near to them, and there were men going among to the houses with water-skins on their shoulders, crying "Water! Water to sell!" The marble pools in the open square were empty; and at one of them there was a crowd looking at a man who was being beaten with rods. A bystander told me that the officers of the city had ordered him to be punished because he had said that the pools and the basins and the channels were not all of pure marble, without a flaw. "For this," said he, "is the evil doctrine that has come in to take away the glory of our city, and because of this the water has failed." "It is a sad change," I answered, "and doubtless they who have caused it should suffer more than others. But can you tell me at what hour and in what manner the people now observe the visitation of the Source?" He looked curiously at me and replied: "I do not understand you. There is no visitation save the inspection of the cisterns and the wells which the syndics of the city , whom we call the Princes of Water, carry on daily at every hour. What source is this of which you speak?" So I went on through the street, where all the passers-by seemed in haste and wore weary countenances, until I came to the house where I had lodged. There was a little basin here against the wall, with a slender stream of water still flowing into it, and a group of children standing near with their pitchers, waiting to fill them. The door of the house was closed; but when I knocked, it opened and a maiden came forth. She was pale and sad in aspect, but a light of joy dawned over the snow of her face, and I knew by the youth in her eyes that it was Ruamie, who had walked with me through the vineyards long ago. With both hands she welcomed me, saying: "You are expected. 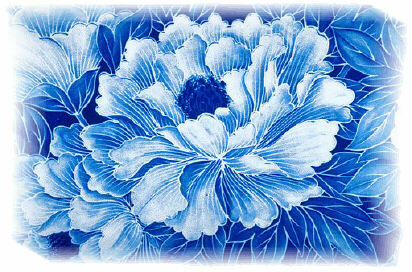 Have you found the Blue Flower?" "Not yet," I answered, "but something drew me back to you. I would know how it fares with you, and I would go again with you to visit the Source." At this her face grew bright, but with a tender, half-sad brightness. "The Source!" she said. "Ah, yes, I was sure that you would remember it. And this is the hour of the visitation. Come, let us go up together." Then we went alone through the busy and weary multitudes of the city toward the mountain-path. So forsaken was it and so covered with stones and overgrown with wire-grass that I could not have found it but for her guidance. But as we climbed upward the air grew clearer, and more sweet, and I questioned her of the things that had come to pass in my absence. I asked her of the kind old man who had taken me into his house when I came as a stranger. She said, softly, "He is dead." "And where are the men and women, his friends, who once thronged this pathway? Are they also dead?" "But where are the younger ones who sang here so gladly as they marched upward? Surely they, are living?" "Where then are the young children whose fathers taught them this way and bade them remember it. Have they forgotten?" "But why have you alone kept the hour of visitation? Why have you not turned back with your companions? How have you walked here solitary day after day?" She turned to me with a divine regard, and laying her hand gently over mine, she said, "I remember always." Then I saw a few wild-flowers blossoming beside the path. We drew near to the Source, and entered into the chamber hewn in the rock. She kneeled and bent over the sleeping spring. She murmured again and again the beautiful name of him who had died to find it. Her voice repeated the song that had once been sung by many voices. Her tears fell softly on the spring, and as they fell it seemed as if the water stirred and rose to meet her bending face, and when she looked up it was as if the dew had fallen on a flower. We came very slowly down the path along the river Carita, and rested often beside it, for surely, I thought, the rising of the spring had sent a`little more water down its dry bed, and some of it must flow on to the city. So it was almost evening when we came back to the streets. The people were hurrying to and fro, for it was the day before the choosing of new Princes of Water; and there was much dispute about them, and strife over the building of new cisterns to hold the stores of rain which might fall in the next year. But none cared for us, as we passed by like strangers, and we came unnoticed to the door of the house. Then a great desire of love and sorrow moved within my breast, and I said to Ruamie, "You are the life of the city, for you alone remember. Its secret is in your heart, and your faithful keeping of the hours of visitation is the only cause why the river has not failed altogether and the curse of desolation returned. Let me stay with you, sweet soul of all the flowers that are dead, and I will cherish you forever. Together we will visit the Source every day; and we shall turn the people, by our lives and by our words, back to that which they have forgotten." "Not so, dear friend, for who can tell whether life or death will come to the city, whether its people will remember at last, or whether they will forget forever. Its lot is mine, for I was born here, and here my life is rooted. But you are of the Children of the Unquiet Heart, whose feet can never rest until their task of errors is completed and their lesson of wandering is learned to the end. Until then go forth, and do not forget that I shall remember always." Behind her quiet voice I heard the silent call that compels us, and passed down the street as one walking in a dream. At the place where the path turned aside to the ruined vineyards I looked back. The low sunset made a circle of golden rays about her head and a strange twin blossom of celestial blue seemed to shine in her tranquil eyes. Since then I know not what has befallen the city, nor whether it is still called Saloma, or once more Ablis, which is Forsaken. But if it lives at all, I know that it is because there is one there who remembers, and keeps the hour of visitation, and treads the steep way, and breathes the beautiful name over the spring, and sometimes I think that long before my seeking and journeying brings me to the Blue Flower, it will bloom for Ruamie beside the still waters of the Source.